Released Spring of 2012. This volume includes the work of 60 current or former guard artists and writers from six of New York City premiere museums. Volume 3 is comprised of two books. One focusing on the visual artists including some in-depth interviews while the second explores art criticism, poetry with additional interviews and some short stories. We are pleased to present for the first time an audio CD from musicians and poets from our ranks. Eclectic to say the least, the CD features rock, hip-hop, jazz, spoken word, folk, electronic, rap and a few surprises. We have twenty-one artists represented here, featuring the widest spectrum of influences and aural diversity. This CD is professionally mastered for the finest sound available anywhere—at our budget. 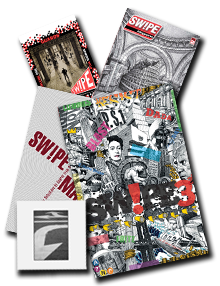 Released in the Spring of 2011, Swipe 2 picks up where our first volume left off, while greatly expanding the scope and incorporating more artists. Swipe 2, still focusing on guards at the Met, had as its goal, to reveal what could not be contained in a single volume, given the vast reservoir of talent at our workplace. We think we accomplished that. This is where it all began—released in the Spring of 2010, our first publication featuring the artwork, poetry, literature and criticism from New York City's Premiere Cultural Institution. Guards' Matter not only calls attention to the simple fact that guards (workers) matter, but the matter they produce is important. Take a look at the magazine that caught the eye of the New York Times, Reuters, NPR and the Canadian Broadcasting Corporation (among others).